1983; 210 pages. Genre : Comedic fantasy. Awards : #93 on the "Big Read", detailed here. Overall Rating : B+. This is the book that started it all - Terry Pratchett's initial Discworld offering. An inept and cynical wizard is forced to safeguard the health of a visiting and very naive tourist. Their (mis)-adventures cause the capital city of Ankh-Morpork to burn to the ground. This is followed by a trip to the lair of an unspeakable evil; then to a dragon-kingdom; and finally to the very edge of the (disc)-world. There are endearing characters, such as : 1.) Rincewind, the wizard who only knows one spell and can't use it. 2.) Twoflower, the tourist who wants to see barroom brawls, fire-breathing dragons, and the rim of the world, and does it all without ever having a sense of danger. 3.) "The Luggage", a hundred-legged trunk that's a devoted bodyguard to Twoflower, and who will devour anyone it perceives to be a threat to him. "Let's just say that if complete and utter chaos were lightning, then he'd be the sort to stand on a hilltop in a thunderstorm wearing wet copper armor and shouting, 'All gods are bastards'." Oh wow! A cross between Sylvia Plath and Douglas Adams. My only complaint is the relative shortness of the book, and the fact that Borders wanted to charge full-price ($6.99) for it. Fortunately, it showed up at the used-bookstore for $2.00. Also, this is a "to be continued" tale - I now have to hunt down Book #2, The Light Fantastic. Assuming it is of similar length, then why weren't the two books combined into a single 400-page volume? I read once that Tolkien's endeavor, when he wrote The Lord Of The Rings, was to simply not have any "dead spots" in it. It seems Pratchett follows this philosophy. I don't think a page goes by here without some sort of mayhem arising. Which makes sense - if you're writing a fantasy, why should there need to be more than a couple paragraphs before something wicked this way comes? In the end, Discworld books are now "three for three" with me. I'd give this an "A" except for its brevity and the annoying need to now find the sequel. It appears a weekend trip to the library is in order. I haven't read this one; it's not at my library and I keep forgetting to request it from one of the other branches. Good point comparing him to Douglas Adams, why didn't I think of that before? Mandy, the series is far from linear. Reading the earlier books would give you a better sense of the history of some characters, and a greater knowledge of the trivia associated with places, but it isn't necessary. I tend to try to pick books based on the characters I like most. For you, I would recommend stories that include Granny Weatherwax, or perhaps "The Amazing Maurice and his Talking Rodents" (or similar title) or "Wee Free Men". Both are considered YA novels, and stand alone well. I'll have to check those out. I've also got The Bromeliad Trilogy on my TBR list. 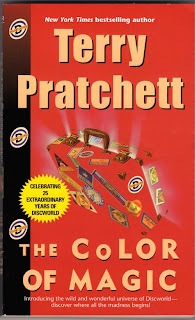 There are a couple book blogs that I follow that rave about Pratchett and that trilogy was recently reviewed on one. I thought it might be a good one to read since it was self-contained according to the review.